November 1st marks the start of our sixth annual Shift Your Shopping season in the Monadnock Region. 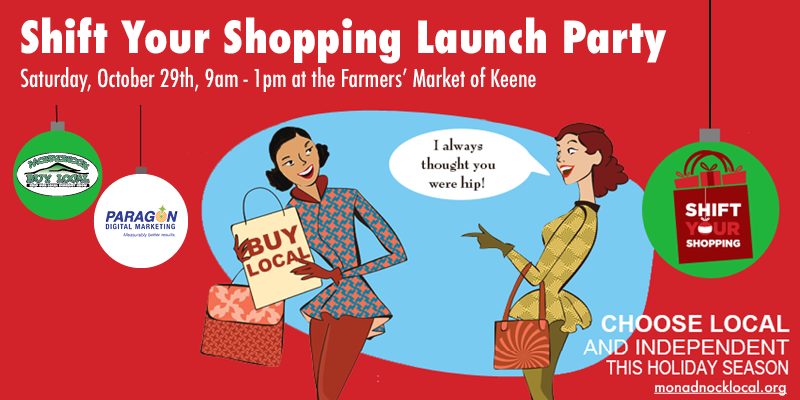 Something new this year: We’re kicking off the season with a Shift Your Shopping Launch Party at the Farmers’ Market of Keene on Gilbo Avenue this Saturday, October 29th from 9 a.m. to 1 p.m. Come pick up a hot off the press copy of this year’s Monadnock Buy Local Guide. 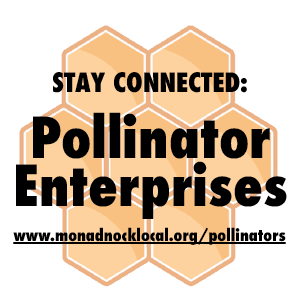 All Monadnock Buy Local members (citizen members included!) who pick up guides on the 29th will be entered into a raffle for a chance to win one of five $100 gift certificates to the Monadnock Buy Local Member business of their choice. Not yet a citizen member? 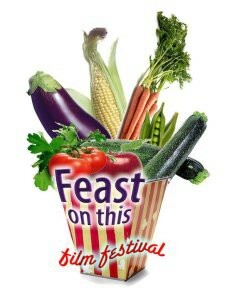 Learn more at monadnocklocal.org/citizen. We'll also have free Plaid Friday, Cider Monday, Small Business Saturday and Shift Your Shopping swag for you to take -- including our new Plaid Friday temporary tattoos. Finally, we’ll have Keene Downtown Group's Local First Night bags. Pick one up and take it to participating businesses on November 5th for 20% off one item. See you at the Shift Your Shopping Launch Party! From November 1st to December 31st each year, Monadnock Buy Local works extra hard to ensure that your spending matches the community values you support. To make our efforts strong, we participate in the Shift Your Shopping movement. This nationwide movement encourages you to support job creation and economic growth through your holiday purchases at locally owned and independent businesses. From your Thanksgiving meal to your New Year’s celebration, are you ready to Shift Your Shopping? Take the Shift Your Shopping pledge to shift at least 10% of your holiday purchases from non-local businesses to locally owned businesses. You can take the pledge at the Shift Your Shopping Launch Party on October 29th or online. What are the bigger impacts that Tim is talking about? When you spend your dollars at locally owned retail businesses in the Monadnock Region four times more money returns to our local economy compared to chain retailers. Spend a dollar at an independent business and 62 cents returns to our local economy, spend it at a chain store and 13 cents returns. Shift Your Shopping includes our signature Plaid Friday Event on November 25th, the day after Thanksgiving. Citizens wear plaid to show their support for our local economy. Independent businesses serve as Plaid Friday Hubs, acting as Shift Your Shopping ambassadors while taking photographs of shoppers for our Plaid Friday Collage. Wear plaid on Friday, November 25th to show your support for our local economy and commitment to buying from locally owned businesses this holiday season. 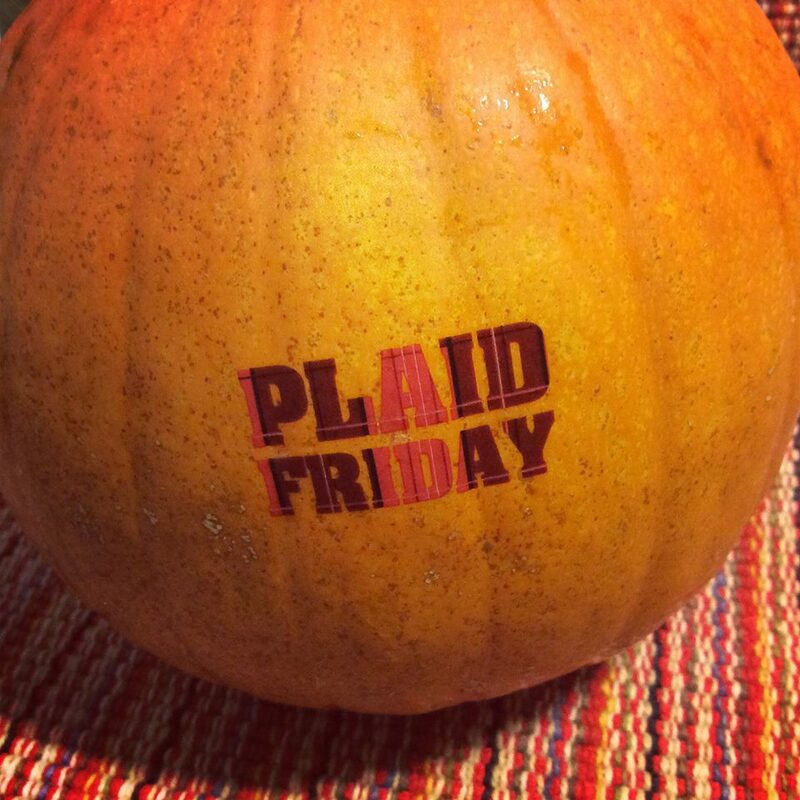 Stay updated on all the Plaid Friday happenings. We’re also celebrating Small Business Saturday and Cider Monday. Stay tuned for more details about these two events. This year's Shift Your Shopping and Plaid Friday sponsors include Badger Balm, Beeze Tees, Bellows-Nichols Insurance, Bergeron Construction, CC&D's Kitchen, Cheshire Horse, Gilsum Freedom Motors, Green Energy Options, Hannah Grimes Marketplace, Howard's Leather, Jeni Skin Care, Korvin Appliance, MB Massage Studio, Monadnock Food Co-op, Nest: Mother Child Home, One Stop Country Pet Supply, Paragon Digital Marketing, Shree's Kitchen, Steele's Stationers, Stonewall Farm, Ted's Shoe & Sport, Walpole Mountain View Winery, Walpole Valley Farms, The Works Bakery Cafe, and Yoga with Josephine. Please join us by voting with your dollars this holiday season. Together we’ll create a true holiday gift to our community -- one that will keep on giving throughout the New Year. Cider Monday is a direct and delicious assault on the Monday after Thanksgiving, infamously known as Cyber Monday. Locally owned businesses participating in Cider Monday will offer community members a warm welcome and a cup of delicious cider on Monday, November 28, 2016. Locally owned stores everywhere are encouraged to join in. 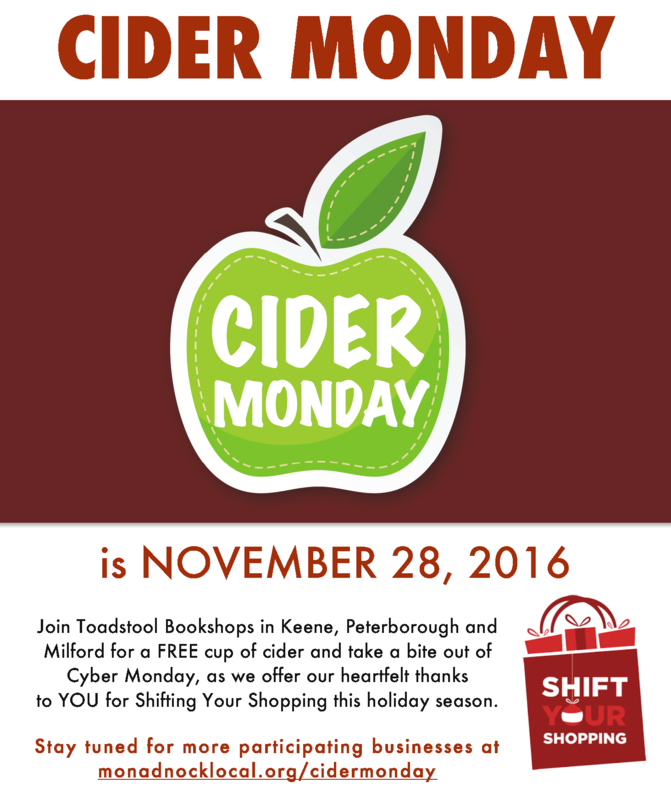 It’s simple, be in your store that Monday to greet everyone with some cider and a heartfelt thanks for shopping at independent businesses. "Customers are promised cider and smiling servers that will not crash," shared Willard Williams, co-owner of the Toadstool Bookshops. "As always, we'll offer personal service, advice and the opportunity to touch and try items -- with no logins or passwords necessary!" Cider Monday, already celebrated in stores from New England to Illinois, is now an international event. Join us in taking a bite out of Cyber Monday. To sign your business up for this year's Cider Monday, contact Jen Risley from Monadnock Buy Local at monadnockbuylocal@gmail.com or 603-499-7950. For more information about Cider Monday, contact Willard Williams at The Toadstool Bookshop, Peterborough, NH at 603-924-3543 or books@ptoad.com. Come to the The Farmers' Market of Keene on Gilbo Avenue (across from Lindy's Diner) from 9am - 1pm on Saturday, October 29th and pick up your hot off the press 2016-2017 Monadnock Buy Local Guides. We're also handing out the Keene Downtown - Keene Downtown Group's Local First Night bags to all community members. MBL Member business of their choice. We'll also have free Plaid Friday 2016, Cider Monday, Small Business Saturday and Shift Your Shopping swag for you to take -- including our new Plaid Friday temporary tattoos. The Shift Your Shopping Launch Party is sponsored by Paragon Digital Marketing. RSVP and help spread the word. Monadnock Buy Local invites all locally owned businesses to participate in this year's Shift Your Shopping Promotion running from November 1, 2016 to December 31, 2016. Shift Your Shopping includes our signature community event called Plaid Friday on Friday, November 25, 2016. During the winter holiday season, Monadnock Buy Local works extra hard to ensure that our spending matches the community values we support. To make our 'think local first' message stronger, we participate in the nationwide Shift Your Shopping campaign. This movement encourages citizens to support job creation and economic growth through their holiday purchases at locally owned and independent businesses. "I think it is important to support efforts like Shift Your Shopping because every little bit helps in a small business," said Tim Pipp, owner of Beeze Tees in Keene, NH. "We are a close-knit community and if we can turn a few people to shop locally it impacts the community in a bigger way. Every dollar spent in a local establishment will come back into the community if we get more businesses and shoppers to support Shift Your Shopping." Participation is free. Monadnock Buy Local will share promotional materials on its website that any business is welcome to adapt and use. 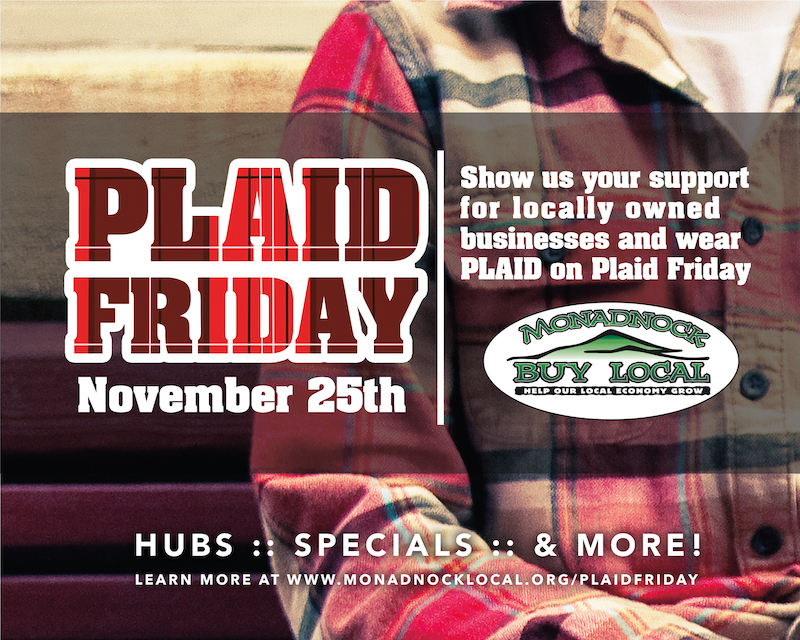 Businesses are encouraged to connect with their customers and let them know they will be open and celebrating Plaid Friday on November 25th. Many business owners ask their staff to dress in plaid and others offer special deals to their customers to thank them for their loyalty. This year's Shift Your Shopping and Plaid Friday sponsors include Badger Balm, Beeze Tees, Bellows-Nichols Insurance, Bergeron Construction, CC&D's Kitchen, Cheshire Horse, Green Energy Options, Hannah Grimes Marketplace, Howard's Leather, Jeni Skin Care, Korvin Appliance, MB Massage Studio, Monadnock Food Co-op, Nest: Mother Child Home, One Stop Country Pet Supply, Paragon Digital Marketing, Shree's Kitchen, Steele's Stationers, Stonewall Farm, Ted's Shoe & Sport, Walpole Mountain View Winery, Walpole Valley Farms, The Works Bakery Cafe, and Yoga with Josephine. Shift Your Shopping promotional tools, social media posts and other updates will be posted at monadnocklocal.org/shiftyourshopping. 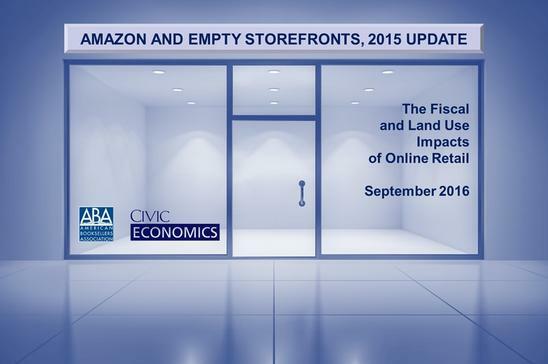 In 2015, Amazon sold $272.3 million worth of retail goods statewide. That is the equivalent of 189 retail storefronts, 0.7 million square feet of commercial space, which might have paid $3.6 million in property taxes. A total of more than $3.6 million in revenue lost to state and local governments, an effective subsidy of $6.96 for every household in New Hampshire. Amazon also operated 0.1 million square feet of distribution space in New Hampshire, employing roughly 95 workers. Even counting all the jobs in Amazon distribution centers, Amazon sales produced a net loss of 1,541 retail jobs in New Hampshire. The quote “Be the change you wish to see in the world,” resonates with me, but what if we adapted that quote to read “Invest in the change you wish to see in the world?” What do you want to see more of in our community? Who or what could you invest in to make this change happen? In 2015, the National Small Business Association noted that 27 percent of small businesses were unable to access the capital they needed to fund the growth of their business. Traditional lenders reject 80% of small business loan applications. Closer to home, the New Hampshire Small Business Development Center (NHSBDC) shared that 45% of all the businesses they work with are looking for capital at any one time. Okay, now back to that thought, I don’t have enough money to invest. On one side of the equation is you -- wanting to support enterprises that are “making the change” -- and on the other side is the entrepreneur ready to make the change happen, if only they had the capital to launch or grow their effort. Enter crowdfunding, the practice of raising funds to support a project or business from a large number of people. Perhaps you’ve heard of rewards-based crowdfunding platforms like Kickstarter or Indiegogo -- where individuals collectively give small amounts of money to support a business idea and, in return, receive a small gift. 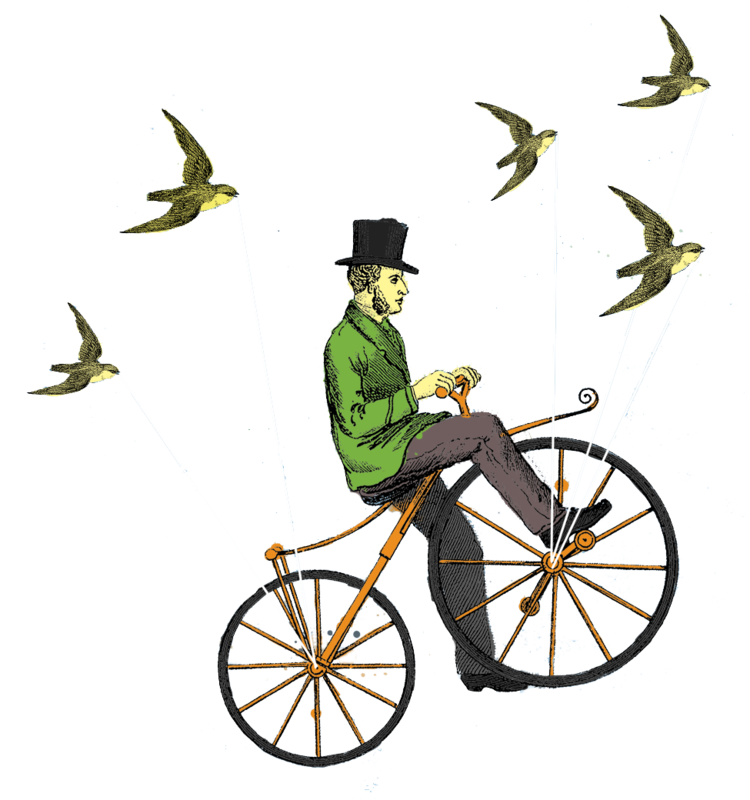 Now there are efforts to “localize” crowdfunding in the Monadnock Region -- allowing you to give just a small amount of your hard-earned dollars to make change happen. The Local Crowd (TLC) Monadnock is one locally based crowdfunding platform that Monadnock Buy Local is helping to start. We want to use the power of crowdfunding to cultivate a stronger ecosystem of investors, service providers and local economy champions investing in a local, green and fair economy in the Monadnock Region. During its pilot phase, TLC Monadnock will launch campaigns that support enterprises based in Keene, Chesterfield, Hinsdale, Swanzey and Winchester. If successful, we’ll expand access to enterprises throughout the region. TLC Monadnock is a collective effort of Southwest Region Planning Commission, New Hampshire Small Business Development Center, Monadnock Buy Local, Hannah Grimes Center, Greater Keene Chamber of Commerce and Monadnock Economic Development Corporation. Another crowdfunding opportunity, where you loan instead of give money to an enterprise, is Kiva. Kiva provides small business owners access to $10,000 loans with no interest or fees. Individuals provide interest-free loans of $25 or more to a business owner on Kiva. Individual loans are aggregated until the borrower’s full loan request is fulfilled. Over time, the business pays back the loan and the investor can decide to take their money out of Kiva or reinvest it into another business. While Kiva works internationally, the Hannah Grimes Center for Entrepreneurship in Keene is helping to connect local businesses to this opportunity. Hannah Grimes advises entrepreneurs interested in securing funding through Kiva and supports them through the application and fundraising process. To learn more about Kiva, contact Jake Nonweiler at Hannah Grimes at 603-352-5063 or financing@hannahgrimes.com or visit kiva.org. "Given the often tricky financing climate in New Hampshire, especially for beginning entrepreneurs, the Hannah Grimes Center is thrilled to be working with Kiva to offer 0% crowdfunded loans up to $10K and with Monadnock Buy Local to support the launch of The Local Crowd Monadnock in our region,” shared Jake Nonweiler from Hannah Grimes Center. “The opportunity we have to shift the financing opportunities for entrepreneurs in the Monadnock Region is promising, exciting and inspirational." Stay connected to local crowdfunding efforts in the Monadnock Region at monadnocklocal.org/crowdfunding. Help us all be the change. We all have a stake in New Hampshire’s economic future. We all want strong communities and a more-vibrant economy. A growing number of like-minded individuals and institutions are putting their dollars to work in their communities - creating tangible social impact while earning a financial return. You’re invited to join Live Free and Start, the NH Charitable Foundation and the NH Community Loan Fund for an early evening event where current and prospective investors can come together to explore opportunities with impact investing and to learn how you can invest in the people and businesses of the Granite State. Three New Hampshire institutions−Live Free & Start, the N.H. Charitable Foundation and the N.H. Community Loan Fund−have teamed up to answer that question for investors and prospective investors across the Granite State. The fifth in their series of free public forums, Investing in New Hampshire, will be held at Antioch University New England, 40 Avon St., Keene on Oct. 13 from 4:30 to 7 p.m.
“A successful startup ecosystem and strong business climate require, among other things, access to capital,” said Mark Kaplan, a Live Free & Start Advisory Council member and chair of its Capital Access committee. Hamilton said the Community Loan Fund has welcomed impact investments for more than three decades. “Our options range from Opportunity NH Investments, which pay fixed-rate returns and support job creation and retention, affordable housing, child care and other vital community services, to potentially higher-yield co-investments in growing businesses,” he said. The presentations run from 5 to 6 p.m., followed by a networking reception at which attendees can ask questions. All are free and open to prospective and current investors and to philanthropists. This event is for educational purposes only; it’s not intended for individuals or businesses seeking investment or capital. Registration is required, at livefreeandstart.com/nh-investing-forums/. Learn more and register for an Investing in NH Forum event here.